Datatag will be attending the industry's showcase event - Motorcycle Live - between 22nd-30th November at the NEC in Birmingham. Their message will focus heavily on the recent results of the success of the industry's official security initiative the MASTER Scheme. Theft figures released by the Police show that a machine not protected by MASTER, and the unique Datatag technology behind it, is 5 times more likely to be stolen than one with its protection. The MASTER scheme has seen all the major manufacturers sign up and has now provided protection to over 60,000 new machines over the past two years since its launch. 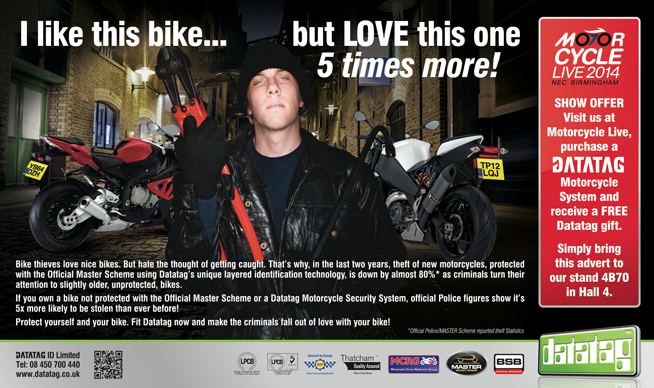 And whilst its effect in reducing thefts is clearly a huge success Datatag is urging owners of products not protected by MASTER, those bikes more than 2 years old, to take steps to protect themselves and their bikes as they become a focus for criminal gangs looking for an easy target. Kevin Howells, Managing Director of Datatag said "The results reported by the MASTER scheme are very encouraging and show a clear reduction in theft due to the deterrent factor provided by our technologies. Our focus must now be to owners of bikes not protected and we urge them to fit a Datatag kit to their bikes in order to safeguard themselves. As thieves recognise the risk involved in stealing a marked bike they inevitably will start to, and clearly are, targeting slightly older but no less attractive bikes not protected." The issue is high on the list of concerns for all brands and Suzuki has been the first to offer existing owners of pre MASTER registered bikes a 'Suzuki Datatag Kit' at a much reduced price. Owners can buy a voucher at the show to take to their local Suzuki dealer and have a Datatag kit fitted - then sleep a little more comfortably at night. For others Datatag will be offering a special show price on their stand 4B70 in hall four and of course will be on hand to talk visitors through the issue of bike theft and their unique layered approach to combating it.